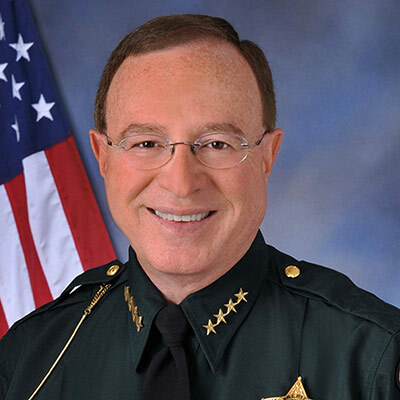 A law enforcement leader respected by his colleagues across the country, Polk County (Florida) Sheriff Grady Judd is a man of strong convictions, relentless in pursuing criminals who prey upon children and compassionate to victims of crime. Equally proactive in helping those who are serving time and want to re-enter society as contributors to their community, he helps inmates get a leg up through skill training. And as president of the Major Counties Sheriffs of America (MCSA), whose members include sheriffs of counties with populations of 500,000 or more, he is focused on issues important to all law enforcement leaders. The following interview provides a brief introduction. What are your goals for the MCSA? I spend a lot of time working on behalf of legislation to increase public safety and support victims of crime. I’m also planning to develop a scientific research arm for the MCSA, which will be rolled out next year. We will partner with science-based researchers on topics that are in the forefront of law enforcement concerns. I have seen policies driven by false narratives, for economic or political purposes, but our research will not be politically based, influenced by the right or left. Its purpose will be to provide state legislatures with the factual information they need to create evidence-based policies. Are there any changes you would like to see in county jails? I want to discourage recidivism by ensuring that incarcerated individuals can re-enter society with the abilities they need to succeed on the outside. In Polk County, we encourage inmates to develop skills in landscaping, mechanics, and other areas and provide certificates of completion for those who earn them. We also work with local businesses, encouraging to employ people from county jail. One inmate asked for a job in the kitchen so she could earn a culinary certificate. When she accumulated enough experience, she got a certificate signed by me—and after her release, got a job. What are the biggest challenges for sheriffs today? Recruiting men and women who want to make law enforcement a lifetime career is difficult. It takes at least 10 years to become competent in all the important areas of law enforcement, but many young people today change jobs every three years or so. Another challenge is changing the narrative about law enforcement. People hear about excessive use of force and other horrific events and assume that they are typical of all officers. The reality is that these negative events are very rare and they don’t accurately reflect the amazing work done by deputies and officers every day. Community relations and communications are a top priority for all law enforcement agencies. January is Human Trafficking Awareness month. Please tell us about your Naughty, Not Nice operations. Naughty, Not Nice is an undercover operation targeting human trafficking that we carry out several times a year. The November operation resulted in 103 arrests on a variety of charges in just one week’s time. The operation focuses on using fictitious media posts to catch traffickers, perpetrators, and other criminals, including individuals accused of kidnapping and murder. Though our focus is on catching predators, our job doesn’t end there. We work with organizations such as One More Child and the Florida Department of Children and Families, which support children rescued from human traffickers. I urge agencies of all sizes to be proactive in hunting sexual predators and human traffickers. These crimes are more prevalent than they appear to be, usually not detected until a child is hurt or killed. Smaller agencies can partner up with other sheriffs or chiefs as well as with state and federal agencies to carry out this kind of operation. According to the MCSA mission statement, an area of special interest is innovations based upon science and technology. What is working now and what do you foresee for the future? Technology will help us become more efficient in law enforcement and corrections. We now have kiosks in jails that allow inmates to communicate with prison management to make complaints or requests and allow us to respond in real time. Drones will soon be used to patrol some areas, and we will eventually see robots on the floors, making sure population counts are right, dispensing medicines in accurate dosages, and performing other tasks. How are you building community relations in Polk County? We are very active in our communities, meeting with faith leaders for instance, asking for program suggestions and their opinions of what we are doing. We also engage in a lot of community outreach. The Polk Sheriff’s Charities gave 1,300 turkeys to needy families on Thanksgiving and will ensure that no child in Polk County is forgotten on Christmas through our Toys for Tots program. We also have a Jeepin’ with Judd trail ride every year, a clay pigeon shooting match, and other events, with proceeds going to the Polk Sheriff’s Charities. But what matters most is our everyday interactions of with all members of the community, and we strive to make every one of those positive.